Earlier this fall, Penna Powers celebrated the five-year anniversary of the day Charlotte Chen first graced the halls of our agency. 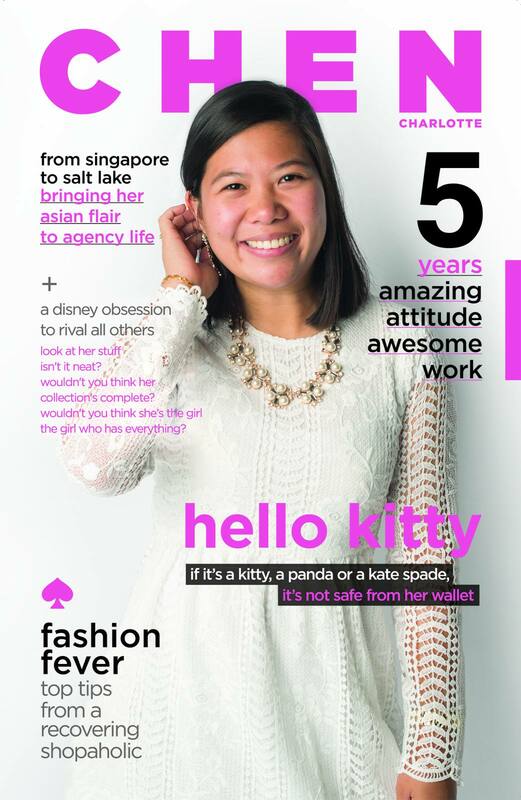 Today, she’s an accomplished project manager who is loved by clients and coworkers alike. She’s the epitome of professional. She’s smart, honest, organized and disciplined—pure gold on the inside—but she’s also taught us a thing or two about looking the part on the outside. To celebrate five awesome years of working with Charlotte, we’re sharing five of her best style secrets. It’s not how much it costs, it’s how you wear it. Penna Powers’ clients have communication budgets that span a broad range. It’s not the size of your budget, but how you use it that matters. To maximize effectiveness, be strategic about how you showcase your brand. When the branding fits your audience well, you’ll get results. Don’t wear something just because everyone else is wearing it. Know your own style and be true to it. Everybody is on WhatsApp, right? You’re not sure what to do with it, but your top competitors are using it and you don’t want to be last to the party. Hold on! Before you jump into any marketing trend, ask yourself a few questions. Does it suit your audience? Is it the best medium for the message? Can you execute it well? Most importantly, can you experiment with this new, shiny thing without sacrificing resources for proven marketing efforts that meet your objectives? Don’t mix and match patterns. Charlotte has a great sense of style, but she is not a graphic designer. However, she is really, really good at taking clients’ ideas to our talented team of designers and coming back with great creative work. One of the perks of working with Penna Powers is that you have a team of design pros who you can always count on. Accessories, including shoes, are a great way to put your own personal spin on your OOTD (outfit of the day). Likewise, there’s no better way to elevate your marketing than to make sure your brand’s unique identity is evident—not overpowering, but elegantly tying your communication efforts together into a cohesive package. Blazers are total wardrobe staples. They can take your outfit from regular to classy/chic. A great blazer tops off an outfit like a great presentation tops off smart communication pieces. Charlotte’s clothing never has a loose thread or a stain. Likewise, when Charlotte sends an email, makes a call or a comment in a meeting, her ideas are never hasty or half-baked. Take your work from regular to chic by presenting it with polish. We hope you’ve enjoyed Charlotte’s style secrets. Thanks, Charlotte, for five years of smart sophistication! Next PostHave You Noticed These Reddit Ads?